When the 600,000 square foot Highstreet Shopping Centre opened in West Abbotsford a few short years back, our technicians were scurrying to outfit individual retailers with robust and affordable security solutions. Highstreet management also approached us, seeking a time- and cost-effective way to control and manage keys for the many security guards, maintenance personnel, and subcontractors who needed regular access to the property. 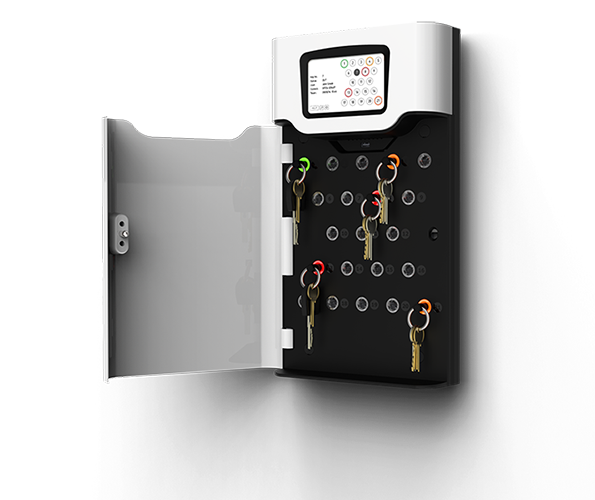 We confidently recommended the Mul-T-Lock Traka21 smart key cabinet. This is a simple yet sophisticated standalone key management system that allows each user to open the cabinet using a personal code that is unique to them. Once they have access to the keys inside, they can only take the set that has been approved for their use by management. The Traka21 audits who takes the keys, and when. Keys are now returned to the cabinet after every shift, never leaving the property. Automating the key distribution in this way has made Highstreet’s money back many times over, based on the time saved from no longer manually tracking keys, and the money retained in the elimination of rekeying costs. Other raving fans of this technology include our client Menno Housing, with two units installed, and plans to add more: to accommodate additional buildings on their property. Serving the central Fraser Valley since 1995, Abby Locksmith hosts the only locksmith storefront location in Abbotsford. We also serve clientele using our mobile fleet of fully equipped vehicles. After hours call out service is available for emergencies. Copyright © 2016 Abby Locksmith All rights reserved.